The Anglo-Zulu war in 1879 was a conflict fought in South Africa between the British army and the Zulus, a native tribe. The accepted aim was to remove the threat the powerful Zulu kingdom posed to further development of British interests in southern Africa. After a disastrous invasion and first battle at Isandlwana for the British, the Zulus counter-attacked into the British colony of Natal. After locating the tiny Rorke’s Drift garrison, the Zulus launched a number of attacks, which only the dogged determination of the defenders and the arrival of a British relief column prevented the garrison from being wiped out. This action earnt the defenders an astonishing 11 Victoria Crosses and 4 Distinguished Conduct Medals. However, there have been a surprisingly large number of misconceptions that have arisen about this battle, mostly from the historical epic ‘Zulu’ of 1964, and I’m going to debunk the big 4 myths in this article. 1. Myth Number 1: Henry Hook VC was an alcoholic malingerer. In the film, Henry Hook is portrayed as an insubordinate alcoholic confined to barracks who happens to be changed by the action at Rorke’s Drift into a better soldier. This is a long way from the truth. The real Alfred Henry Hook was a Victoria Cross winner, teetotaller and later Sergeant-Instructor of the Volunteer Reserve. The portrayal of her ancestor so shocked Hook’s family that they walked out of the film’s premier! Born in Gloucestershire in 1850, Hook joined the army in 1877 at 26. He was rarely, if ever, in trouble with the regimental authorities, and had even started to draw additional Good Conduct Pay in respect of this at the time of Rorke’s Drift. His VC citation records him as part of the section assigned to the defence of the hospital: He helped another private soldier move 8 of his injured comrades inside the main defences by knocking down several interior walls, all whilst being attacked by assegai-wielding Zulus which he kept at bay through the use of his bayonet. 1. Myth Number 2: The regiment defending Rorke’s Drift was Welsh. Although the 24th Regiment of Foot would be renamed the South Wales Borderers in 1881 following reforms, at the time of Rorke’s Drift the regiment’s official title was the 24th (The 2nd Warwickshire) Regiment of Foot, and as such it was not officially a Welsh regiment. There were however, proportionately a large number of Welshmen present at Rorke’s Drift (34 of the total number of defenders), as the depot for the regiment was in Brecon, very close to the then-Welsh border. 1. Myth Number 3: Men of Harlech was sung by the defenders in an Anglo-Zulu battlefield ‘sing off’. As the 24th Foot was not officially a Welsh regiment, ‘Men of Harlech’ was not its regimental march, and as such was not sung by the men present. There is very little evidence, from troops present who spoke about their experiences to the official histories, that there was any form of battlefield singing contest between the Zulus and the British. If there were, the men who were there would have been singing ‘The Warwickshire Lad’, and not ‘Men of Harlech’. 1. Myth number 4: Colour Sergeant Bourne was a middle-aged veteran of many campaigns. Again, not so. 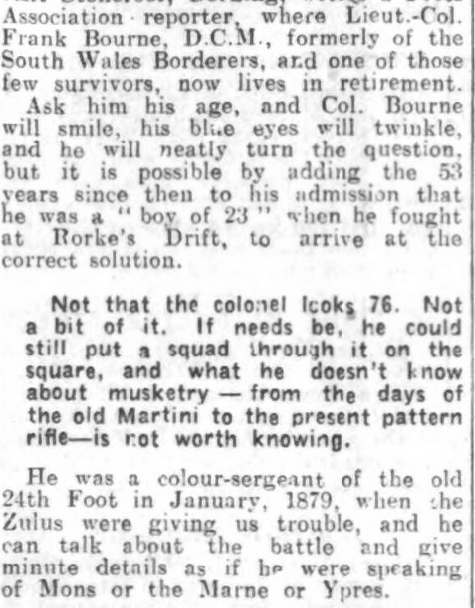 Francis Bourne was actually the youngest Colour Sergeant in the British Army at the time of Rorke’s Drift. Born in 1854, he joined the army in 1872, and rapidly ascended the ranks. At only 24 years of age, he became a Colour Sergeant, a senior NCO in charge. 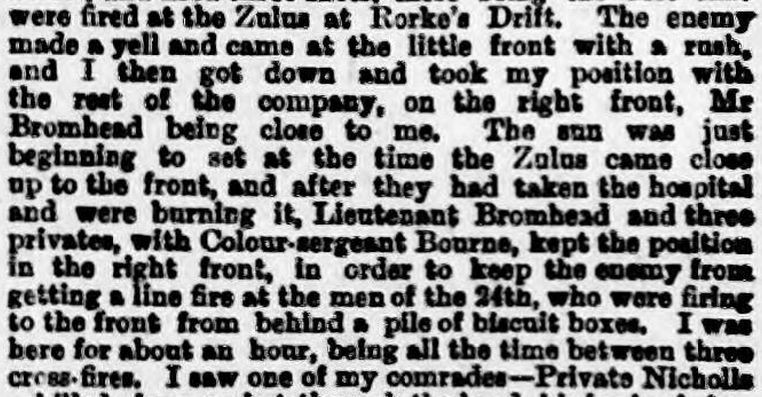 The age of the actor portraying him in ‘Zulu’ is off by about 40 year age wise, but is not in the portrayal of the steadfast coolness and confidence under action that won Bourne his Distinguished Conduct medal. Fred Hitch relays an account of the battle that mentions the steadfast nature of his Colour Sergeant. Bourne went on to serve in the First World War, and only retired in 1919, a full 40 years after the action at Rorke’s Drift. An interview in the Hartlepool Mail in 1934 shows he still remembered the battle clearly years later. Thank you for the information, it is interesting what the Movie world will do in order to make a film seem more "sensational", however, reading your account of the true Rourke's Drift encounter with the Zulu's, makes me feel like we missed a lot of the real sensational actions of the Men, that should have been brought to light through the films story, maybe a remake is in order, I would certainly want to see it. Thank you, Just like the film Patriot, they have got the story line totally mixed up and have added their own interpretation to glamorise the story and twist the truth into a load of fiction. I have a distant relative who fought and survived the Battle of Rourke's Drift. George Edward Orchard, a native of Bristol, changed his surname to Edwards when, at the age of 21, he enrolled in the South Wales Borderers - his South Africa medal, is in the regimental museum in Brecon. I have a much fuller account of George's experience in the battle and also a photo of him - it is interesting to relive the encounter through the eyes of a serving soldier. I am connected to George through my paternal grand mother, Emma Orchard. I have see the film many time but didn't dream that they would Chang the part of Hook. So different from the caricature. This is precisely why I never watch films based on something that happens in real life, or is based on a novel, the y never follow the true life version, or the story in the novel. It ruins the film for me. We should always remember the first commandment of media:- "never let the truth stand in the way of a good story". I always thought that film was a load of rubbish! I wish it could have told the true story, which sounds far more interesting. The facts and figures are merely our way of telling or trying to find the truth.. In 1964 film-makers could get away with these major historical gaffes, but today's audiences are more discriminating when it comes to playing with the truth. Thank you for publishing this. One of the many sins that can be laid at the door of the film industry! very grateful for these updated details on what was my deceased husband's favourite movie of all time! Glad to have historical justice properly served! Thank you for telling us what the true version was. I trust that filmakers are more held to account nowadays. Were the Zulu nation south Africans. Were. they coming down south Africa as Whites were coming up it. The real people were the Bush people? The film Zulu may not have been historically accurate, but it was still a very good movie! Most, if not all, films based on real events are 'tweaked' in some way, and we know it, don't we? Does this come as such a huge surprise to people? Also, it's possibly due to this film that people have become so interested in, and fascinated by, this heroic conflict. I believe that the site of the Rorke's Drift battle is now a big tourist attraction. Would this have come about but for the film? And if a film, however inaccurate, leads people to become so interested in the subject that they go on to read and learn more about the event in question, surely this can only be a good thing. Apologies, no idea why my comment has appeared twice! One final comment, which is that the acting performances in the film 'Zulu' were so brilliant that I, for one, can forgive its few inaccuracies. It's called entertainment! Shame that our view of history is constantly being coloured by the film makers lack of historical accuracy. Soon we won't know what to believe. The only thing that is worth serious attention about this article is that film scripts use dramatic effect to make a more economically viable film. I'm afraid the rest is a load of imperialistic twaddle. Why had the english empire taken it upon itself to invade zululand? Aren't the zulu people a nation much as the english are? Even more worrying is the fact that nothing has been learned: england, aka britain, is still going off on foreign japes and causing mayhem in the name of fair play and british values: consider the 600,000 iraquis who paid with their lives in order to slake the blood-lust of Bush and Blair. Sorry to offend you: there are many ways of viewing history: i choose to look from the viewpoint of the underdog. Lari, l think you've spoilt, what was, a good set of comments by including Iraq in your "comment". If you'd have stuck to the real subject in hand, l would have added my thanks to all who took the time to make their feelings know. As it is, my comment now ALSO has nothing to do with the subject in hand. ?? Finally, to GR and those other people who made their feelings know, thank you for your honest remarks. ?? There's history and then there's Hollywood bunkum!